1. Welcome to Evosep - What matters in Clinical Proteomics? We are getting a lot of questions about Evosep these days, and we are excited that you want to know who we are and what we do. To answer the most asked question and to share our perspectives on clinical proteomics we have conducted four short blog post for you to read. What Matters in Clinical Proteomics? At Evosep we aim at improving quality of life and patient care by radically innovating how protein based clinical diagnostics are performed. 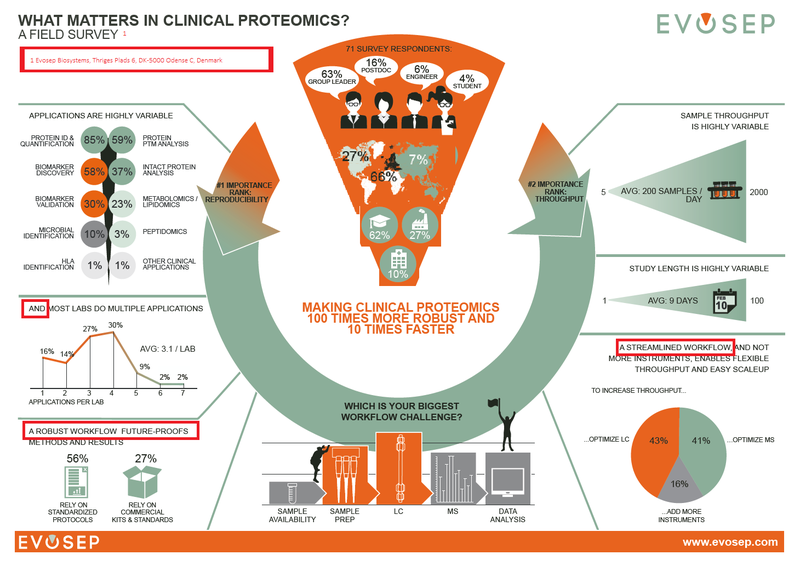 To get a better understanding of what matters in Clinical proteomics, we asked exactly that question in a survey where more than 70 scientists took the time to respond – group leaders, postdocs, students and engineers, working in academia, industry, and hospitals all over the world. It is important for us to gain insight into how scientists work. what matter for you in clinical proteomics? We have initiated this discussion on clinical proteomics – so please do not hesitate to get in touch with us with your questions, comments or feedback.